This volume provides a general account of the philosophy of David Hume in a way that shows that he is, contrary to common belief, a highly systematic thinker whose thought and personality are closely related. 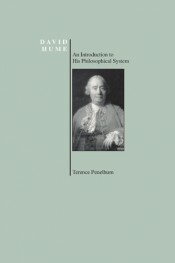 it is also designed to assist the reader to make the most informed use of the rich resources of contemporary Hume scholarship. Terence Penelhum was dean of Arts and Science from 1964 to 1967 and head of the Philosophy Department from 1964 to 1970 at the University of Calgary. From 1978 to 1988 he was professor in the Department of Religious Studies; he has been Professor Emeritus since 1988.